October 30, 2018: We’ll begin again on the morrow. October 23, 2018: “You’ll find truth at the empty mountain.” - Eyas’ Journal. October 16, 2018: The boys have a lot to discuss. What lies ahead? Who can be trusted? October 9, 2018: We are in the process of wrapping up Season 1 of ChasmQuest. Season 2 is set to release mid-2019. What will you do in the meantime? BECOME A PATREON MEMBER!!! And you’ll have access to bonus content between seasons and throughout the duration of ChasmQuest releases. Click the link below and join at any of the four tiers! October 2, 2018: The Rowdy Boys are stranded on the beach of Loch Caite. A Verakin woman finds them, she is in distress, will the boys be heroes or failures? The Feckless Four will determine that. Listen now. September 25, 2018: There’s something in the water. Follow the Rowdy Boys out into the Last Lake to hunt down the beast beneath the depths. September 18, 2018: The Rowdy Boys wrap up their time at the Cardendale Outpost and on the way to Avondol tensions run high. Once at the Ox Mounter’s Pub at Avondol the PCs are able to rest and laugh over an epic wrestlin’ match. September 10, 2018: The Rowdy Boys make it to the Cardendale Outpost and spend the night with the Greycloak Rangers. Do you have enough courage to follow them into the thick of the Shawlands? 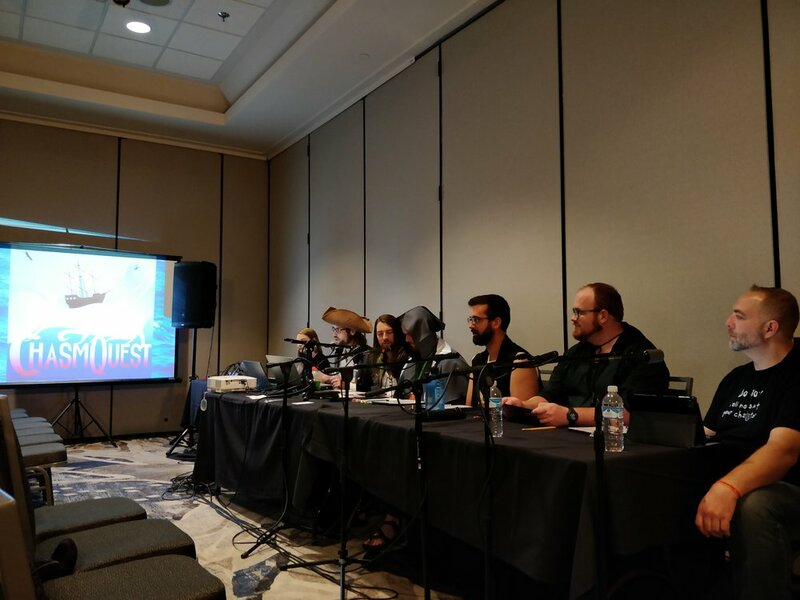 September 6, 2018: The Q&A portion from our live show at Hypericon 2018 back in July. Listen in on the DM and PCs as they answer questions from the audience. You'll here our unique philosophies and practical advice about Dungeons & Dragons, podcast inspirations, friendship, community, and many other good, good things. August 28, 2018: What evil lies within the Blackstone Cathedral? Find out in our latest episode “Abbot’s Feast” and join the #RowdyBoys and our guest Preston for a spooktacular good time. August 21, 2018: The narrative portion of our live show is now available for download and streaming! Join the Rowdy Boys on the pirate settled Lock Islands! August 14, 2018: Hello folks! We've just posted Dolphin Bait, a Memory on the Chasm Sea and Episode 4 - Silver is a Metal. There is plenty of humor and excitement to brighten up your day as the Rowdy Boys delve into the Cold Iron Mines at Ben Iver while simultaneously delving deeper into the mysteries of the New Lands. Listen now! August 7, 2018: Eyas puts Mashed Potatoes in Duke Eirwyn's chair. July 31,2018: Episode 3 is live! Meet new NPCs Lumen Yew and Finn Aurora, two talented individuals who leave lasting impressions on the Rowdy Boys. We also get a sneak peak into what will make ChasmQuest the story of the century... I'd say the plot thickens but I find it too cliche. Instead I'll say that this...story...slays. YASSSS QUEEN! Check it out today! July 30, 2018: To help get you hyped for Episode 3 of ChasmQuest we've released ANOTHER bonus episode. July 24, 2018: Memories on the Chasm Sea track the Rowdy Boys' time spent voyaging from Treland to the New Lands. Over the next 5 weeks we'll release these bonus episodes along with our full-length eps. This week's memory has the Rowdy Boys stop, drop, and rolling, and you will be too... from laughter. July 20, 2018: Episode 2 is available! Hear the origin of the group's name the Rowdy Boys as they face their first obstacle in the New Lands. Fun and trouble await in this endlessly entertaining episode. July 12, 2018: Caverns & Serpents is an in-game D&D 5e tutorial for all our listeners who maybe aren't as familiar with roleplaying games. Our hope is that by playing D&D as our D&D characters we could both inform and entertain you the listener. Having an understanding of the basic mechanics of D&D will help you follow the epic storyline of ChasmQuest. Enjoy! July 3, 2018: Season 1, Episode 1 of ChasmQuest has been officially released. We will release episodes biweekly with the exception of bonus episodes! Rate and subscribe to get all ChasmQuest content as soon as it's released. Thank you for your support and we hope you enjoy the first season. June 28, 2018: Parts 1&2 of ChasmQuest Beginnings are now live! Find out how our PCs end up on the excursion to the New Lands. You may even learn a bit about the land of Treland, its history and polity. June 26, 2018: On Sunday, July 8th 2018 ChasmQuest will be performing a live bonus episode at the Hypericon convention in Nashville, TN (600 Marriott Dr, 37214). We will be hosting our episode and D&D podcasting panel from 10am-12pm. To register go to hypericon.net. The men and women of Thesla’s Grace have been endowed with the task of protecting Lord Protector Alistair as he makes his way from Dunaber to the unexplored Eastern Reach of the New Lands. Within this crew is a small pack of unique adventurers, they are known as the Rowdy Boys. Khol-Uun is a half dwarf- half human bard who grew up in the great dwarven city of Ben Ness with his mother Galira. He was never fully accepted in dwarven society Fleeing the hostile city, he began his journey to find his uncle Grunyar. On the way he met the woman who not only taught him to fight but also taught him the basics of being a bard. Collin Allen lives and works around Nashville, TN. He grew up there and has been playing D&D for 10 years and has both embodied many different characters and been the DM in a few games himself. He loves nothing more than camping and reading a good book. New hobbies include editing and cosplaying for Chasmquest. At a young age, the stoic and mysteriously white haired Eyas was witness to two assassination attempts. The first robbed him of his mother & 11 years of memory. The second robbed him of his sight. Not months after, an unknown magic awakened inside himself that gifted him with a magic sight and saved him from perilous flames & sure death. This half-elf’s senses are keen, and his drive for greatness as a fighter is strong. He also loves women. Like, a lot. Taylor is a graphic designer/illustrator from Nashville, TN. He is fairly new to tabletop RPGs but loves storytelling and eating fruit. He also loves being excessively dramatic in order to fit in. Rory "The Hammer" Kilgannon is a rough-and-tumble halfling barbarian who grew up in the hills of Denshire before moving to the metropolis of Weswick, where became a cage fighter. Rory says what he thinks, when he thinks it, which tends to rub folks the wrong way. Brad Kinnison lives in Smyrna, TN with his lovely wife Delaina and their dog Rey. He is a nerd to the core, who loves Star Wars, horror movies, novels by Isaac Asimov and Stephen King, and American/Tennessee history. You can regularly find him on his day off playing disc golf at one of the many beautiful local courses. Thelneous does not know where he came from. His earliest memory is of the church, where he was orphaned and raised. As he came of age, he adopted the family name Gray to both describe his background, and more personally, his faith. He is cunning, slow to anger, and relies on his charisma and wit more than any physical prowess. Micah Jordan is the author and voice actor for Thelneous Grey. He hails from Nashville TN, is married to the beautiful Sarah Jordan and has two wonderful Australian Shepherds named Nash and Si (pronounced sigh). He’s been playing D&D for nearly 8 years and has both Dungeon Mastered and played several characters. Hand selected by the High Council of Treland the following characters are to join and lead the Rowdy Boys on this excursion into the New Lands. Lord Alistair and Lady Reina of the family Popkin are nobles and relatives to the monarchy, Alistair has been named as the Lord Protector of the New Lands to rule in King Aston's stead, Reina is along for the ride. Duke Eirwyn, a high elf diplomat and lawmaker, was on the voyage to discover the New Lands decades ago. He has been vital in establishing a relationship with the local high-elves of Alfrheim. Captain Abram MacDonnelly, a bearded older gent who served in the king’s naval ranks for over thirty years. He wears a regal blue jacket at all times along with a three pointed hat. Hails from Sutland was captain of the voyage that discovered the New Lands. Commander Leon Fite, First Knight Order of the Flame, is the highest ranking officer, acting as leader of all the knight's orders and the royal guard. He is always heavily armored and bearing his gold infused longsword, Nametaker. Finn Aurora is a wilderman who pledged allegiance to the crown 15 years ago. He acts as guide and translator through the New Lands. Lumen Yew, a wood elf from Norholm and last of the Yew Tribe. She's a soft-spoken ranger and acts as game huntress and forager. She has a small falcon named Autumn. Bishop Cullum Kindhearted, an elderly cleric of Thesla, who is not so kindhearted to the wilderfolk. He wields a warhammer named, Thesla’s Justice, the head of which is shaped like the Theslan infinity sign. Master Penvro Gwynne is a high-elf bard and Trelander historian. He plays the lute and sings, and is also taking an account of the journey. He grew up in Woldsworth and moved to Weswick to teach. The world, myths, and storyline of ChasmQuest are all original material. Andrew is a librarian with almost 7 years of Dungeons & Dragons experience spanning several systems and genres. He is a fan of all imaginative fiction and gains the majority of his inspiration from novelists such as, Ursula le Guin, Tolkien, George RR Martin, JK Rowling, David Mitchell, and Octavia Butler. He is also a fan of narrative driven games like, Mass Effect, Last of Us, Skyrim, and Uncharted. He's also been known to watch a bit of Game of Thrones, Vikings, and Queer Eye. His love for audiobooks and tabletop roleplaying games married in his work on ChasmQuest. You can find him sipping coffee and reading on a porch, or running D&D programs at the Nashville Public Library. peace shall ever be the plight of our people: man, dwarf, elf alike. Home to the native high elves, they have proved crucial for Treland’s colonization, both military and resource support. Avondol - river’s meadow, farthest of the Lathes, mainly a military outpost. The river mouths into Loch Caite (Last Lake) no one has developed further due to wilderfolk raids. The kingdoms to the West of Kinsdale divided by shallow lands that you can only cross at low tide. Norholm is half human and half wood elf populated, while Sutland is 60% dwarf and 40% human. Within the mountain range and forests the few remaining orc tribes live out quiet lives, most of the time. Ben Ness - Dwarven city named for the mountain it lives within. Penton - city on a hill in northern Norholm, Prince Ethan son of Aston rules here. Monastery of the Eights located just outside the city. Kingdom of the eastern island, the richest of and home to the king of the Trelands, the island is 60% human, 20% halfling and 20% high elf populated. Woldsworth - The largest settlement in the north of Kinsdale, mainly populated by the high elves and surrounded by forestry. The high elves have used their cunning to gain representation on the king’s council and use their power to tax and serf the surrounding human population. Although trained solely in Weswick these knights roam all three islands freely acting as agents of the crown. They have even begun to help populate and protect the New Lands. Stag’s Order - Military leaders, masters of war and tactic, they organize the Greycloaks a collection of criminals and vagabonds who could choose hanging or a ranger’s post. Order of Vipers - Those who deal with the obtaining of secrets, mainly dealing with resisters and rebels to the crown. Sir Quincy is First Knight of this Order. These are the remaining tribes of the forests of Norholm, although a few tribes do populate the forests of Kinsdale. Their numbers continue to dwindle as humans settle more land and use more of the Norholman trees for resource. Aspen - Group of elders dedicated to ending their tribe, they have no chief and simply live out their final days as sages for the younger tribes. They foresee destruction in the next generations. These three clans have made up the dwarven population for many generations, each has its own unique features, making Ben Ness the lively city and mining establishment it is. Treland’s royalty traces its roots back to the High Lords of the time before peace. Of course the rulership of Elric changed all that in the first year of our Lord Thesla, and until King Aston all Kings had shared a bloodline with Elric, Treland’s first king. High Council - Notable: Duke Eirwyn, high elf advisor and lawmaker. Grunyar Duncanyon, dwarf of the Ironbar Clan. Lord Alistair Popkin, human noble, head of the council. Chief Haldir, wood elf of the Willow Tribe. Bishop Cullum, human, highest ranking in the Order of Thesla. And three others representing the remaining cities and settlements. Lord Protector Alistair Popkin (Newly Appointed) - Standing in for the King in the New Lands, acts as ultimate ruler and protector over the Trelanders in the New Lands. There are now two settlements of High Elves with the discovery of the New Lands. Woldsworth - Governor Thandor, leader of the high elves and owner of the Farmers Federation an organization that distributes the goods and payments to the surrounding farmers of Woldsworth. Alfrheim - Elvenking Amrynn, son of Valdir. Stepped in after the death of his father, who was countless centuries old and had been ruler since the settlement of Alfrheim. The governance of Alfrheim is much different from and more complex than the micro organization of Woldsworth. It is more rooted in the governance of their homeland, the Isle of Bardha, and is independent of Treland’s rules, although since their arrival to the New Lands the high elves have been nothing but generous and hospitable. Acolytes: Those in training to serve the temples and communities. Clerics: Priests of Thesla, whom have been recognized as leaders within their temple or community. They act as mitigators healers and seers for the public. Bishop: The political and religious voice of Thesla, chosen by the Church to serve until death, they are stationed in Weswick residing in the Burning Cathedral’s Manor. They serve on the High Council as a voice for the church.